‘Carnatic A Cappella’, is testament to the fact that Indian classical music lends itself to experimentation. Ever since the Carnatic mix of Ed Sheeran’s ‘Shape Of You’ went viral, the Creative Director of IndianRaga (global community of performing artistes), a vocalist, pianist, composer, arranger and music educator Vinod Krishnan has created a separate fan base for himself. Vinod is trained in Carnatic music, and is also a certified musician from the Trinity College of Music. The combination leads to interesting results. He loves to experiment with different genres, such as infusing Indian classical music with jazz and a capella. ‘Carnatic A Cappella’, is testament to the fact that Indian classical music lends itself to experimentation. Growing up in Chennai, the December music season, long music classes, music competitions in the sabhas, piano lessons in school and AR Rahman’s music pretty much sums up Vinod’s childhood. “My mother’s family has strong music genes. There was always someone at home who ensured my practice happened regularly. Then Yanni was introduced in the late 90’s. He was another big influence,” says the musician. Speaking of the music scene in Tamil Nadu, Vinod feels that the current music scene in Chennai is flourishing. “So many new composers in the last few years who have made such a strong presence - Santosh, Sean Roldan, Anirudh, Nivas, Gibran, GV, Hiphop Tamizha, Imman, Govind Vasantha. So many new singers, and above all so many genres and independent music. So Far Sounds, open mics, indie bands and artists. You name it, we have it,” he says. He believes that any genre of music has the flexibility to blend with another, as they are made of the same seven notes. “Most of my collaborations have happened on the IndianRaga channel, a US-based startup that has a very strong international brand and provides a powerful platform for independent musicians to collaborate. My approach has been to explore new arrangements and combining genres, but most importantly set a high bar for aesthetics. Otherwise audiences will quickly dismiss it. Finding the right aesthetics is always tricky, especially when you have different genres that sometimes have inherently conflicting approaches,” he explains. Talking about his take on Tamil freedom fighter Subramania Bharathi’s poems, the musician feels that Mahakavi Bharathiyar’s verses are rhythmic, precise, gentle, profound and inspiring, all at the same time! “What a genius! One of his poems from his collection of Kannama Paatu, is ‘Ninnaye Rathi Endru’, a very popular poem that has been around in many versions both in live performances and in films. I’ve brought together a capella and an orchestral arrangement, that is mellow, yet romantic. This project also features an IndianRaga dance fellow Sophia Salingaros, who has choreographed and performed bharatanatyam to depict Bharathi’s words, and ballet to depict Kannama,” he reveals. “As Bharathi’s words are literal, and our perception of Kannama is abstract, so are the corresponding dance forms where bharatanatyam depicts the more literal abhinaya, while ballet depicts the abstract perception of Kannama,” he adds. 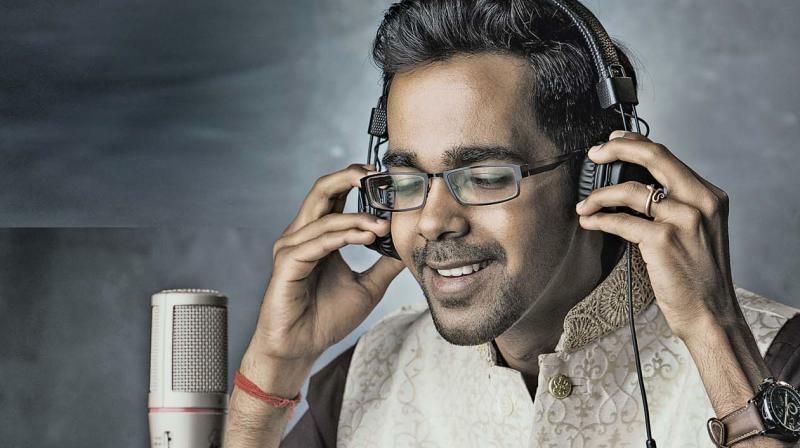 A 10-minute chat on Google Hangout and a month of recording the track, filming and editing it was all it took for Vinod and his collaborators to make the record breaking Carnatic mix of the popular Ed Sheeran track-Shape of You. “Shape of You Carnatic Mix is the break to global audiences that my collaborators and I made for us. With YouTube, social media and a strong brand like IndianRaga, we did this experiment that turned out very successful. Aditya, Mahesh and I never met in person to do this track. We had unprecedented media coverage and a huge increase in audiences who started following my work,” said the musician. Even though it’s 2 years since the track released, Vinod still sees random families and individuals walk up to him at airports, restaurants and gatherings telling how this one track inspired young ones in their family to take up classical music. “How music reaches each generation is different. So if this is what it takes to direct a whole generation towards Indian classical music, I’d do it a lot more. The youngsters now see that the many years of classical training is what made this possible, so they realise the value of perseverance, commitment and consistent practice. Otherwise, with so many distractions today, it’s difficult to get young ones committed to something like this,” he says. For Vinod, singing with AR Rahman is more of a milestone dream. “I know it will happen, I am just working to make it happen sooner. The impatience helps,” quips the artiste. “Other artistes who I’d love to work with and whose music I’ve enjoyed a lot are Govind Vasantha, Yuvan Shankar Raja, Amit Trivedi, Gibran, Santosh, Sean Roldan. Govind is my new favorite - his music I feel lends itself more for live performances too, in the very arrangement. Understandably because he has worked with Thaikkudam Bridge, so lot of that background is there. Amit Trivedi and Gibran - their melodies are so new with such unpredictably new arrangements that are so novel. Santosh and Sean - it’s exciting to see how they seamlessly weave orchestral music in the most unexpected scenes. For example, in Jigarthanda, there’s that one scene where Siddharth and Karunakaran fight and nearly lose a bottle of alcohol. The entire scene of the flying bottle is in slow motion. Santosh’s orchestral score was the icing on the cake. I love how much thought these composers put into re-recording. Speaks a lot about their approach and diligence. As a composer, I see many of their movies repeatedly just to listen to the background score, he explains. Vinod reveals his next projects— “Bharathiyar’s Ninnaye Rathi Endru that’s out in a few days and I am also working to script and produce my first Tamizh independent single. I’ve composed and sung the song,” he says. This single is about a married couple and their matured yet playful relationship. It’s about breaking the stereotyped dynamics between a husband and a wife, and how one can see their partner as an equal, in so many ways. “The stereotyped rhetoric of unbalanced relationships is there all around us. My work is just a reflection of a growing collective desire to redefine these relationships,” he explains. For the musician, success has given more opportunities to perform and has made him more optimistic as well as cautious. Optimistic because now he knows what audiences look for and he has the clarity to do more along those lines. Cautious because audiences are picky, so the same formula may not work repeatedly. “You have to deliver contrasting content to be engaging and relevant in their minds. I love that challenge,” Vinod signs off. Shh! For your ears only!